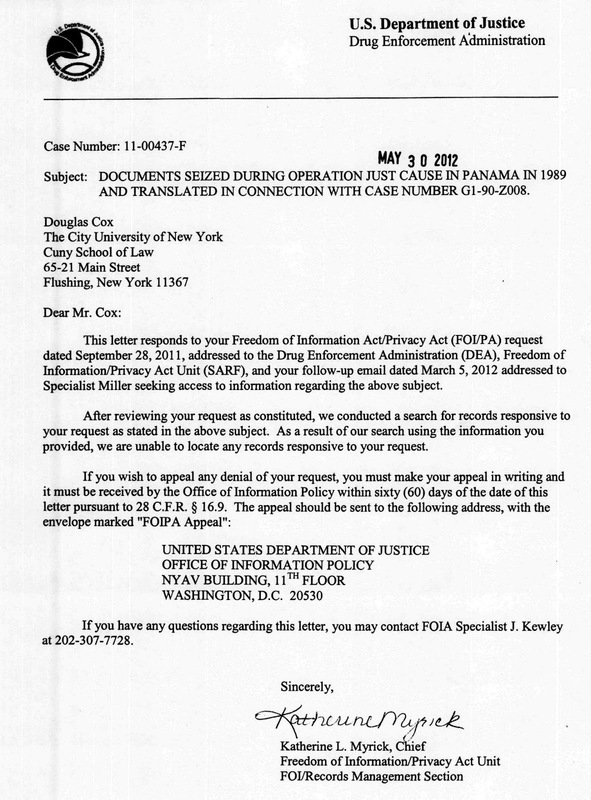 Last year I submitted a FOIA request to the Drug Enforcement Administration (DEA) for copies of its copies of documents seized by the United States in Panama in 1989 and English translations of those documents made by Master Translating Services, Inc. (MTSI) pursuant to an agreement with the DEA. MTSI translated thousands of the documents, which took approximately a year and for which the DEA paid more than $100,000. I have received the DEA's response to my FOIA request, however, which states that the DEA was "unable to locate any records responsive to your request." Like an earlier unsuccessful request to the DIA for its copies of the Ba'ath party documents obtained by the Iraq Memory Foundation, it could be that the DEA search simply failed to locate documents that are in fact in agency custody, but the result is, in any event, disappointing. The DEA's response does not address an additional part of my request, which had asked for a copy of the records schedule that authorized the disposal of the records in the event they were not retained.